- Fairy Dust gives you new cards for being nice! - Munchkinomicon gives you new cards for being nasty! 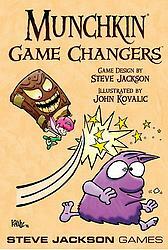 - Monster Enhancers is full of ways to help the monsters! - Reloaded! is full of ways to help the players! Also included are the cards from Munchkin Fairy Dust Dice and two big sparkly pink dice to go with them, plus four cards formerly only available directly from Steve Jackson Games! This set also introduces new Fairy Dust and Munchkinomicon-themed level counters!